Francisco Ocejo has been learning, applying, and teaching the Toyota Production System in over 100 companies for the last 12 years in Canada, USA, Mexico, Central America & Europe. During this time, he has taught and applied Lean from the senior management level to the operational levels closest to Gemba from international corporations, to mid-size and small family businesses. 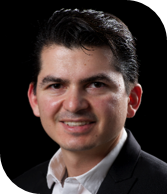 Francisco is a former Celestica leader & manager of the Lean Culture Transformation working with BlackBerry (RIM), Palm, HTC as their principal customers. This transformation involved over 5,000 people. The Business Unit started with scrap of over $1 Million a month, high absenteeism, low productivity, long production lead times and internal and supplier quality issues. By coaching the Leadership team through a Lean Transformation beginning with the training people through all levels they were able to reduce scrap to only 0.035%, achieve 100% On-time-delivery, improve process flow and lead times and dramatically increase Direct Labor Efficiency. Francisco is a Toyota Kata Ambassador and the first Mexican who taught and spread the Toyota Kata in Mexico. He has been applying Kata with Dr. Jeff Liker and many other Coaches in companies. Francisco has helped develop people in TPS principles and assisted in many operational improvements at several companies. For over 5 years he has been coached by Dr. Liker and Mr Shingo, the former President of the Toyota-China joint venture. He has also been trained by various Toyota top managers over the years. Francisco has taught classes for students in over 15 Universities, lecturing in various Congresses in Mexico on TPS and Kata. Franciso holds a Bachelors of Science in Industrial and Systems Engineering from the Monterrey Technical Institute. He also has MBA from IPADE. He is a certified Six Sigma Black Belt from the Institute of Industrial Engineers, and has certifications in the Theory of Constraints and Thinking Process from the EGADE of the Monterrey Technical Institute.